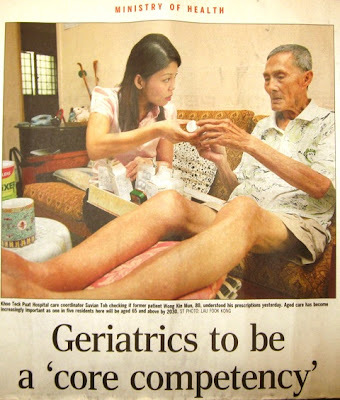 ﻿ Mr Khaw Boon Wan, Singapore's Minister of Health, announced on Friday that geriatric medicine will be a 'core competency' for all doctors and nurses. A far-sighted move, given the fact that by 2030, one-fifth of the population will be aged 65 and above. The government is making sure that all health-care professionals will be equipped with the knowledge and skills to help the elderly manage their diseases well. Priority will be given to the treatment and care for five major problems that afflict the elderly: hip fractures, stroke, heart failure, chronic obstructive pulmonary disease and diabetes. The aim is to help patients make a smooth transition from hospital to home. More support will also be given to caregivers who suffer from burnout and emotional stress, and to voluntary welfare organizations such as NTUC Eldercare, to help them expand their home-care services. When I read the above news yesterday, little did I realize that in less than 24 hours I would be in dire need of some geriatric knowledge. 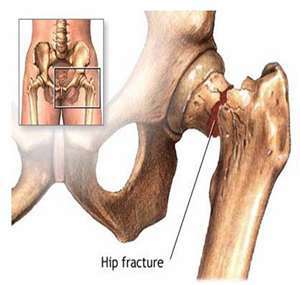 The doctor on night duty explained to us with the aid of visuals the type of hip fracture that mother has. My 85-year old mother had a fall Sunday (yesterday) afternoon. I came home to find her lying flat on the floor just outside the bathroom door. She was conscious but somewhat confused about why she was lying there. Afraid that I might aggravate her pain by moving her, I called for an ambulance. It arrived within five minutes. My brother and sister-in-law helped me get her admitted to a specialist hospital in PJ. The X-rays showed she had sustained a right hip fracture. Surgery seemed inevitable. The doctor would give us a clearer prognosis a few hours from now (Monday morning) after examining her. We would know what the options are - if any. At her age, it would take a while for my mom to recover sufficiently to be on her feet again. As I look at the days ahead, one thing is for sure - I will have to learn how to tend to my mother's special needs during the healing process. I've read enough and seen enough to know that caring for an elderly patient during and after hip replacement surgery can take a toll on the caregiver. Do the work a day at a time. All the best. let me tell u abt my elderly neighbour. about two years ago while shopping with her son, she fell n broke her hip. she was in hospital for a while. after her discharge, she checked into the columbia hospital for recuperation. i visited her at the hospital in shah alam (there are branch hospitals as well). she looked cheerful, her mind still alert. after a few months when she was well enough to move around (with the aid of a walker) she returned home. a live-in maid was hired and worked for mother n son for a year. now, there's weekly cleaning service. outings are made easier with the use of a foldable wheelchair. and ah por still cooks, almost on a daily basis! so don't put too much pressure on yourself. use whatever facilities available. you are not being less filial. Thanks, Viv, for sharing about your neighbour's recovery from her hip fracture. Thanks too for the kind words. Moral support goes a long way in lifting the spirit of the caregiver. One of the most important things when one goes through a surgery is the one who will take care of him/her during the recovery. As always, we need someone patient to take care for us in this phase.